[Costume plate of Grebenski Cossacks in the Caucasus] - FERRARIO, G.
Title : [Costume plate of Grebenski Cossacks in the Caucasus]. Size : 8.3 x 10.6 inches. / 21.1 x 27.0 cm. 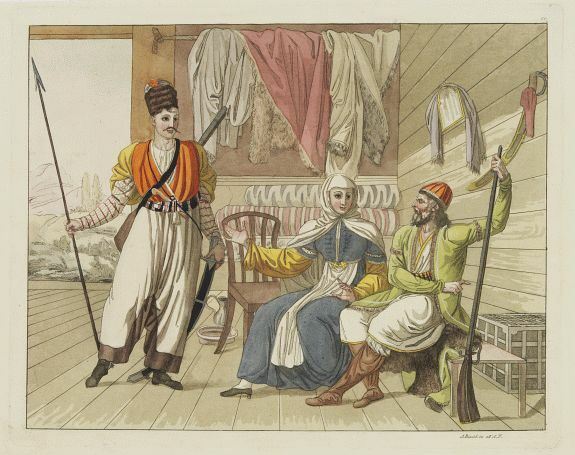 Description :Aquatint costume plate of Grebenski Cossacks in the Caucasus. Plate N° 10. From Giulio Ferrario's work Le Costume ancien et moderne ou histoire du gouvernement, de la milice, de la religion, des arts, etc. published in Milan by the author between 1816 and 1827. Engraved by A.Biasioli. This aquatint engraved plate was colour printed on fine move paper, bearing the embossed seal of authenticity impressed at the time of publication with the legend "Il Costume Antico E Moderno" surrounding the initials GF. Condition : Mint condition. A beautifully hand colored aquatint with additional hand-colouring.